who says writer's block can't be productive? Harry Potter Kit – Christmas FTW. Harry Potter Wizard Chest – Christmas FTW. Someone hand me the award. Because I nailed Christmas gifting this year. Totally nailed it. There was a time when I won a different kind of parenting award. The not-good kind. The I-can’t-believe-you-forgot-the-Easter-Bunny-you-terrible-mother kind. But this? This is legit. Isn’t reading incredible? I love that this Harry Potter journey has been the catalyst to my children’s desire to learn to read. I now have a voracious reader of a daughter and an up-and-coming preschooler boy who is figuring out so many words already. They want to read. And let me tell you, it takes a special kind of book–one that they’ll always remember–that first inspires young readers. Thank you, JK Rowling. I took a long break from writing the sequel to my novel, Hiding Haelo, to put together the ultimate Harry Potter lover’s chest. This all started with a little pin I saw on Pinterest of a printable Marauder’s Map. My kids will love that, I thought. 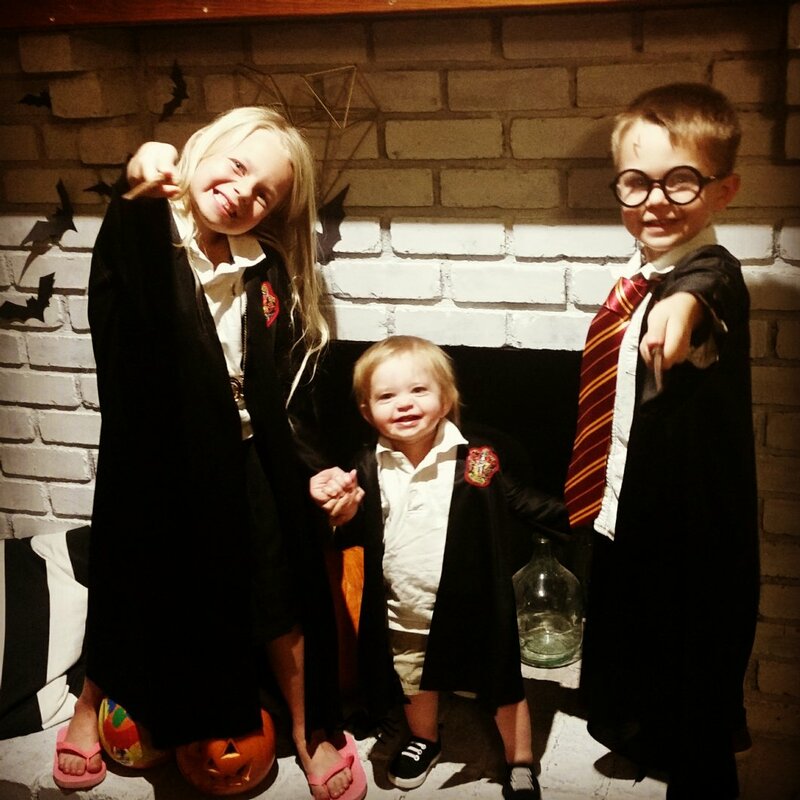 My kids are obsessed with Harry Potter. I might have encouraged that obsession, but it’s there nonetheless. Well, that Map started a chain effect, which got waaaay outta control. Next thing I knew, I was spending hours a day for way too many days putting together the ultimate Harry Potter wizard kit for each of my two oldest kids. Nailed it, guys. Nailed it. Harry, Hermione, and little Ron-ette. Aren’t they cute!? Look at those faces. Or this one. Look at this face. So they have everything they need to play wizard. Except, well, magic. Disclaimer: I have a printer, a sewing machine, a hot glue gun, epoxy, and a laminator (okay, my mom has the laminator). A good friend of mine already had the chocolate frog mold, too. 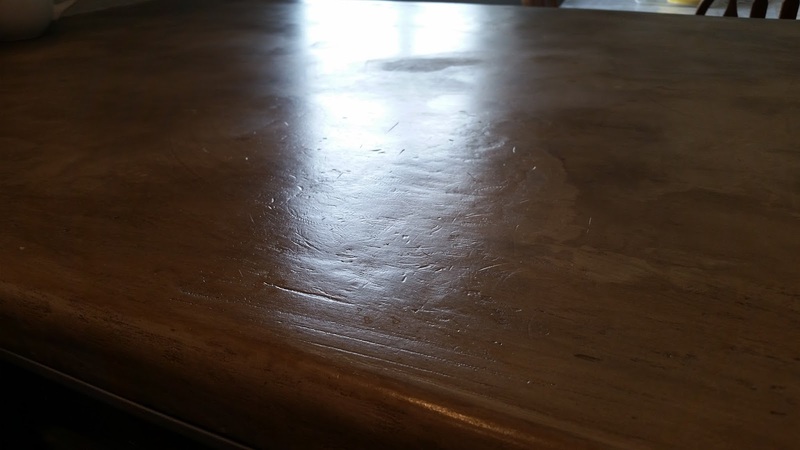 I had leftover faux leather from when I cut a leather topper kid-shield for my freshly-stained kitchen table. I also already had off-white cardstock, embroidery thread, gold sewing thread, small glittery ornaments, wire ribbon, chopsticks, spare composition notebooks, wood stain, modpodge, an old leather studded purse, neodymium magnets, Hershey bars (we’re a s’more family) and those little plastic treat bags. The Hogwarts robes, Harry glasses and Hermione necklace we already had from Halloween. So really, I only had to buy the paperweight “sorcerer’s stones,” the hinged boxes, the photo prints for the encyclopedias (in which I used a 50% off coupon code), photo albums from the dollar store, Bean-Boozled jelly beans, glitter scrapbook foam, and “quills.” The biggest expense by far was when my printer ran out of ink. Because our $30 printer uses $45 ink. Seriously. So, yes, these kits were relatively inexpensive … for me and my stocked crafting horde. If you had to buy everything from scratch it could get pretty pricey. Expense aside… the time put into these was so far beyond reasonable. The encyclopedia alone took me like 5 days of go-to-bed-at-three-in-the-morning. But lucky you, I did it already! So if you want to make these, you just have to print! Go ahead and click on each item to get to the good stuff. Someone pat me on the back. After I’d put the whole thing together, I placed the quills (in their packaging) at the bottom of a big box (because they don’t fit in the treasure chests), then placed the chests on top. Then I added the wrapped Funko Pop characters they asked for for Christmas (Quidditch Harry, Sirius Black, Dumbledore, Hagrid, Hermione, and Luna Lovegood) and threw in their Halloween Hogwarts robes to keep all the boxes from shifting around. Harry Potter FTW. SuperMom FTW. P.S. Did I mention that a stuffed Hedwig, and a super awesome Firebolt broom might have also been Christmas presents this year? Nailed it. I totally nailed it. Reading is awesome. My daughter couldn’t read when we started this journey. She had little interest. Now she’s a voracious reader. She got a few different beginner chapter books for christmas from different people and she’s been plowing through them. I’m sure you have those *certain* books from your own childhood that inspired your reading. Yay for that. Pinterest Valentine’s Fail, times two. It’s high time I stopped succumbing to the Pinterest fantasy. “I’ve got to get my kids’ valentines done!” I said. “Hey! I’ve got a heart shaped ice cube tray!” I said. “I’ve got crap-loads of broken crayons lying around here somewhere!” I said. “I can do that!” I said. Well mine looked like crap. Aaaand I ruined my tray. Aaaand it was a pretty silicon one. Aaaaand I probably left them in the oven way too long because the colors blended super weird with a film of waxy/oil almost-color across the top. So instead, I bought my son the cheap Star Wars valentines at the grocery store like he wanted from the beginning. No candy. No super cute quote. No not-candy-but-look-at-this-cool-item-because-I’m-a-really-on-the-ball-mom pun thing. Just a small piece of holographic cardstock. And my son LOVED IT. But my daughter, who’s been through this song and dance before, straight up ASKED me to look at Pinterest. “Pentrist?” she said, with a hopeful smile. They get ’em young, I’m tellin ya. I didn’t think this one through. I printed that printable on hot pink paper, cut them out by hand (because who has the “circle cutter” mentioned in the post?) and taped those babies to my dollar store applesauce all within an hour the night before the kindergarten valentine’s party. I felt awesome. Correction: awesome sauce. Everything was going according to plan. Do you know how much 28 applesauce cups weigh? It’s a lot. Like, too much for a forty pound kindergartner. When my daughter’s carpool ride arrived, I had to walk out, help her load the bag of cups into my neighbor’s van, and mumble some weird apology/joke about how I was making my daughter lug half her body weight around in a new-baby gift bag. She came home and told me that her friend had to help her haul the valentines across campus into class. It wasn’t until later that day, as my daughter and son were going through all of the valentines they’d gotten from friends that I realized something else. We never put her name on her valentines. So now, I don’t even get the credit for being the healthy mom. What’s the point of being the healthy mom if I don’t get the credit! Oh, not the point, riiiight. Verdict: Holographic cardstock valentines for the win. But we ended Valentine’s day with a lovely family BBQ, drawing with chalk on the back porch, watching the sun set. I love my Valentines. All four of them. Did I mention my husband painted my portrait? And nope, he didn’t have help. He said the wet smudges at the bottom are “cloud nine.” Because I’m floating. UPDATE! click here for how these counters have fared 3 1/2 YEARS LATER. Novel writing exploits took a backseat today. Lucky you? 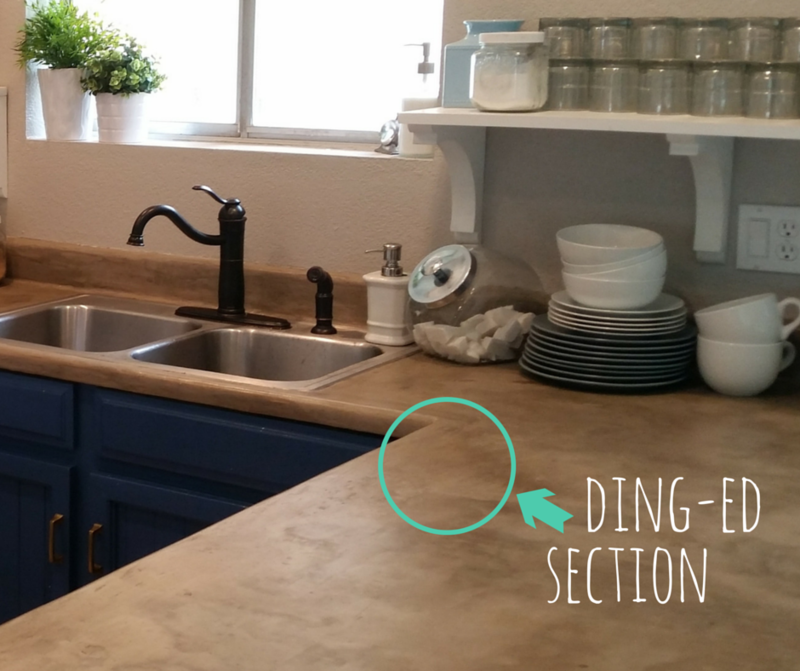 I was perusing Pinterest this morning and saw another concrete-over-laminate countertop pin. You know the countertop treatment popping up on the internet? 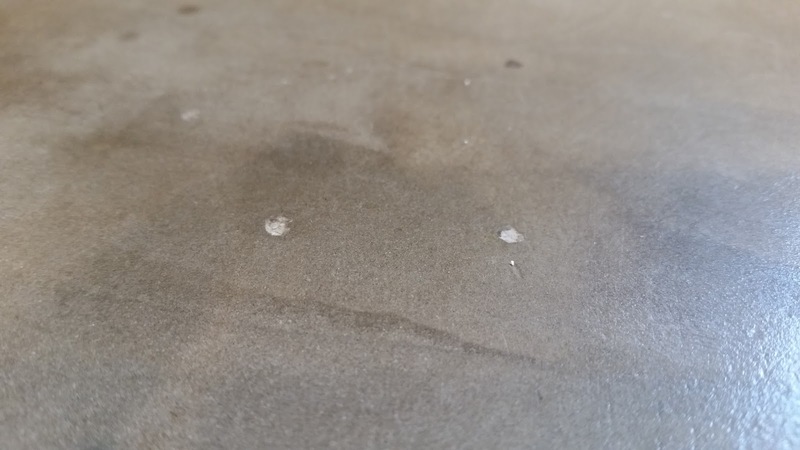 The one using Ardex Feather Finish concrete “painted” over sanded-down laminate or formica countertops? I smiled to myself, remembering when I first saw those pins and thought rather smugly, “Oh, we could totally do that!” Well, last summer, I took that smug opinion and put my (not much) money where my confident mouth was. If you’re wondering how that treatment holds up, this is the post for you. There may be hints and tips and tricks, but this is by no means a how-to post. This is a how-did-it-hold-up reality post. Yes, this is a new type of post for the ol’ blog, but it’s my blog. You’re not the boss of me. What do you think of my on-the-cheap, mostly DIY kitchen remodel? I’ll post more (including the unrecognizable before photos) on that one later. I still have a couple of things left to do. But for now . . . The house the hubs and I bought last summer had pretty awful laminate countertops. They were probably great in their hay-day, but we must have inherited them from a butcher . . . or serial killer. I’m talking knife gashes and slices everywhere. Chunks missing. Had I a bigger budget, I might have sprung for the quartz countertops I really wanted. But after raising the kitchen ceiling, electrical work, A/C duct work, new lighting, and DIY shelving, (it was a brutal summer) we basically had enough money for paint. And maybe cheap cabinet pulls. So, we took the plunge. The Ardex Feather Finish countertop plunge. Painter’s tape, plastic drop cloth, face masks, electric sander, utility knives, taping knives (a.k.a. drywall spatulas) similar to these, old bowl/bucket, whisk, old soft rags. It took 3 adults (one of which had done this before) one long evening, then 2 adults for a second night. That said, we had an electric sander. If you are sanding by hand, expect it to take a lot longer. To begin, we wood-putty’ed over the missing chunks in the counters. Then we sanded with an electric sander, and savagely scuffed those original gashed badboys with utility knives. That was just as fun and it sounds. Then came the many, many super-thin layers of Ardex (with sanding between each coat). After drying came the sealant layers. Then the waiting game. Ready for the good stuff? The big questions? Chips. (See the lighter gray dots?) This happens when something both heavy and sticky is left on the countertop. When said item is picked up later, chips can occur. I’ve got 4 tiny chips in the corner by my stand-mixer, 2 next to my stove, a long-skinny chip up against the wall by the stools, and another little tiny one in the main workspace. (When I say tiny, I’m talking pin-head tiny, not even as big as a pencil eraser). Not bad for nearly a year of wear and tear from our rambunctious family of four. Why does it ding? Because this part of the countertop for some reason is much thicker than the rest. We probably missed this in sanding one of the layers. Maybe it soaked up more sealant and therefore has a little give to it? I’m not sure of the science behind why the thicker concrete dings. Normally, each layer gets sanded down until completely smooth, almost as thin as paint, resulting in a final, smooth surface. This little section was never completely smooth, and noticeably thicker. The plus side: I highly doubt this thick part will chip. But it has definitely “aged” with these lovely “character” dings. I actually kinda dig ’em. Scratches. Truth be told, I didn’t notice any at all. Then I read Sarah’s experience with scratches and looked very, very, closley. Technically I guess you could say there are things that look like scratches. But they’re not like mini slices through the sealant, they’re like tiny, almost imperceptible lines scattered throughout. Like my dinged section, but to 1/10th of the degree. Almost like the miniscule leftover markings on a pad of paper from a previous sheet: the ones you only notice if you color the clean sheet carefully with pencil lead to reveal the hidden message. They don’t even show up in the sunlight unless you are really searching for them. I think maybe Sarah’s showed because her countertops were black and she used non-countertop wax to try to seal them. Stains. Yes, I said there were no stains. In truth, no amount of berry juice, melted popsicle, soy sauce, or other nefarious stainer has penetrated our food-grade concrete sealant. However, right along the seam to our stove, oil/grease seems to have seeped into the concrete. See the darker half circle right at the edge? I’m guessing our tape job (to protect the countertop-installed stove during this whole concreting process) wasn’t up to par. Or maybe when we pulled the tape up afterwards, it pulled up a tiny bit of the sealant. I don’t know. But, yes, I do have those tiny pockets of oil along the edge. 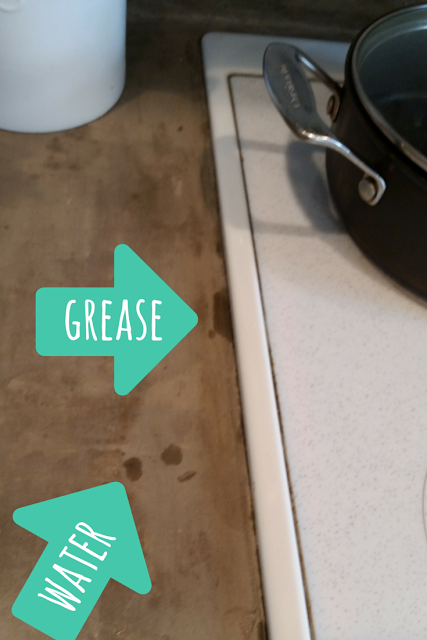 See the little dots an inch to the left of the stove that look very similar to the oil/grease stains? That’s what happens when water is left pooling on the countertop over the top of a chip. (I had just finished cleaning the counters before I took the picture). Water is absorbed through the tiny chip, then spreads out wider underneath the sealant. Guess what? They dry! Those little dark dots disappear after about a half hour. Which brings me to a stain precautionary: It has not happened to me, but I would venture to guess that if berry juice (or other stainer) was left pooling over a chip in the surface, and it absorbed, and then dried, it very well could stain. Just a thought. Ok, at this point, some of you might be asking “Tara, why don’t you just dab a little sealant over the chips?” The sealant requires a process, which I could try, but I’m scared of it turning out uneven and looking worse than the teeny tiny chips do. To appease you, dear readers, I might try it and post about later. We’ll see. To get a flawless seal, I would have to re-sand and seal the entire countertop. And I am not quite ready to do that just yet. #2 – What would I have done differently? A few things. First: I’d do more layers of concrete. I think we did 5 really thin layers. Yes, the surface is super smooth, but I actually would prefer a surface more like my little 5-inch section with the character dings (another pic zoomed out below). Personal preference, but I like dings more than chips. The thin-ness in some areas makes me a tiny bit nervous. It’s pretty thin. Second, I’d heed the directions a little better with the sealant. See the photo above? The dull bit in the sunlight? Right above my dinged up section? That’s a spot where the our sealant didn’t soak in as well as it should have. I’ve got two of them. This is because we didn’t get the concrete wet enough during the sealing process. When they say get it wet, they mean really wet. Wet enough to soak into the concrete and stay wet while you apply the sealant. That spot must have dried too much by the time we got the sealant wiped over the top. It doesn’t stain, and it doesn’t soak up water like the chips do, but it’s not as shiny. So it’s noticeable in certain lights. #3 – Would I do it again? Absolutely. This is a fantastic countertop. It looks great, it feels great, and it holds up better than I thought it would. As a matter of fact, if I get enough chips to necessitate a change, I’m planning on doing it again. Tape off the room with plastic, a little (or lot) of sanding, a few more layers, and re-seal. Though I’m guessing I’ve got a while before that will be necessary. 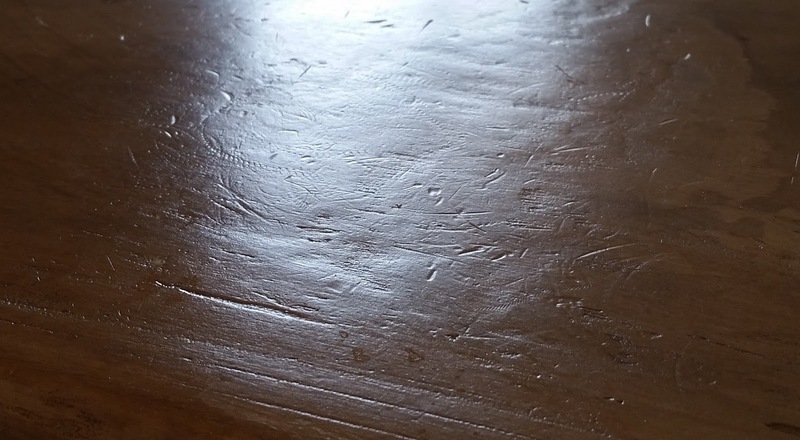 The only thing about this countertop that I can’t do that I wish I could do: run a flat razor blade over the surface to clean hard, crusty bits. I’m pretty sure it would knick the sealant if the blade caught a ding, chip, or other imperfection. HOWEVER, the project is labor intensive. And takes a significant amount of time. And very messy. (Use the hose or utility sink to clean up, not your kitchen sink, which should be taped off and covered anyway.) And concrete dust will be EVERYWHERE. Also, this is not a 3 hour project. This is not a one-night project. And if I were you, I’d tape painter’s plastic over entrances, doors, cabinets, etc. to keep the insane amount of dust contained. (Remember the sanding? Lots of sanding.) Be prepared and willing. We weren’t moved-in when we did this, and I am so glad I didn’t have to wipe concrete dust off of belongings in addition to house surfaces and fixtures. 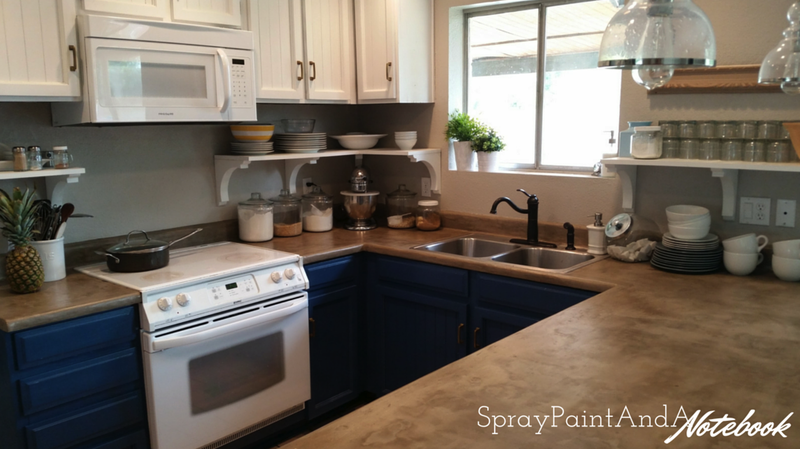 If you don’t have the money for solid countertops like marble, quartz, granite, or even butcher block, I’d suggest this as a great alternative to cover those old laminates. If you didn’t already know, this Ardex treatment is cheap. I’d also do it if I had older cabinets and didn’t have the money for new countertops and cabinets. Because putting expensive countertops on older cabinets is not a good idea. The counters will likely crack if you later try to take them off to replace your cabinets, and you might just decide on a different cabinet footprint and wouldn’t be able to use your previously installed expensive countertops anyway. AND… again… we had serial killer countertops. And a tiny budget. What choice did we have? Dang, I’m proud of my DIY kitchen remodel. Just wait until I finish adding my tarnished gold pulls to those blue drawers and finish up my crown molding. For in-depth instructions, visit: Here, Jenny over at LittleGreenNotebook.blogspot.com, and then here, Laura over at ABeautifulMess.com. So, there you have it, folks. The not-so-ugly ugly truth behind those internet concrete-over-laminate countertops. AAAAAND NOW, click the photo below to see how these counters are doing 3.5 years after install!